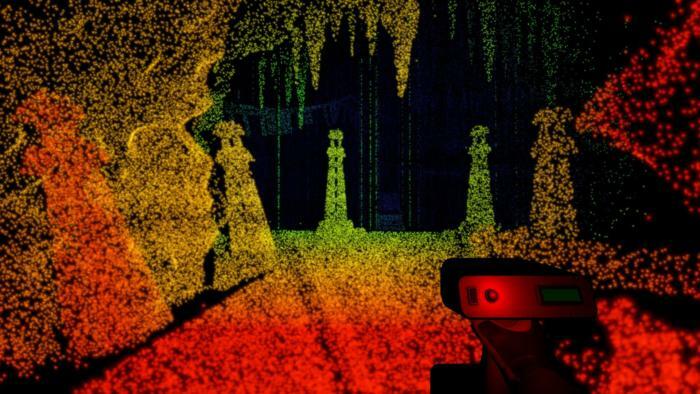 Introversion's Prison Architect follow-up is a highly experimental art piece about navigating a dark cave with a handheld LIDAR scanner. It starts like a nightmare. You’re hundreds of feet below the Earth’s surface, plumbing the depths of a seemingly endless cave, and it goes pitch black. Darkness all around, so dark you can’t see the ground beneath your feet, the water dripping around you, or the backs of your own hands. And then, a beam of light. 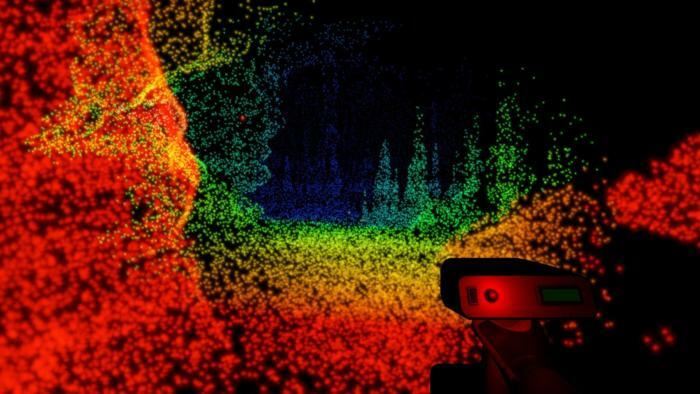 Or rather hundreds of beams, all shooting out of a handheld LIDAR scanner. The world around you turns red and orange and green and blue, mapping your surroundings with thousands of tiny points of light. It’s as beautiful as it is cold and digital, a haunting Seurat landscape. Enough light to see by, and enough light to climb your way out of these caves—or at least to see what else is down here with you. 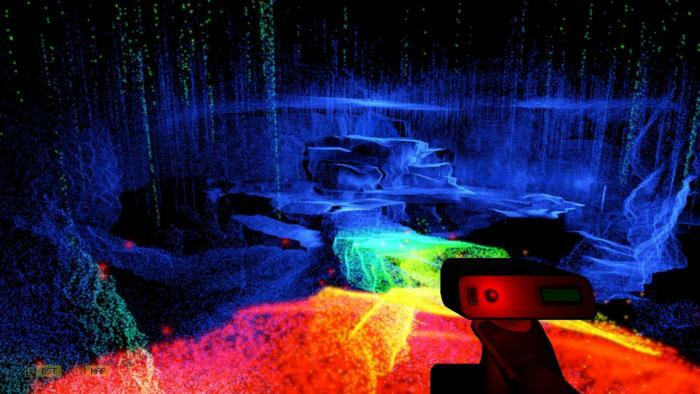 Scanner Sombre is going to be marketed as the next game from Introversion Software, “the Prison Architect devs.” I know because I’ve already seen that description in PR emails and preview articles. And it makes sense! Prison Architect is the most successful and mainstream game Introversion’s made. There was a time before Prison Architect when Introversion made much smaller, more experimental games though—Uplink, Darwinia, DEFCON. And the thing is, Scanner Sombre is much more identifiably that Introversion than the one that made Prison Architect. 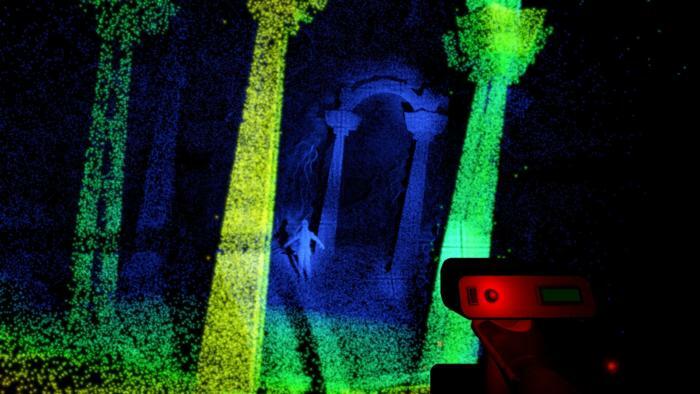 Like Introversion’s older games, Scanner Sombre is an experiment centered around a singular idea and mechanic—in this case, LIDAR. You really do spend the entirety of the game in a dark cave, your sole interaction with the environment just mapping its edges so you can walk through. I’d call it a gimmick game, were it not so well-executed. I’m also tempted to call it a horror game, but it’s not. Not really. It borrows some horror elements, especially from the found footage genre, but most of the dread is inherent to the setting itself. There’s a palpable sense of claustrophobia to Scanner Sombre’s cave, encouraged by the stark audio design. A rushing river, the sound of your feet scuffling against gravel, or wind blowing mournfully through narrow passages is all the more haunting when you can’t see them clearly. Is that a stream you’re about to wade into or a river echoing from hundreds of feet below? Hard to tell. This push and pull, between information given and information inferred, is at the heart of Scanner Sombre. At its best, it demonstrates how limited data can lead you to wildly incorrect conclusions. At its worst, it’s just...exploring a cave. In the dark. Rewards are smartly paced as you scurry through the tight passages, though. You’ll periodically happen upon scanner upgrades that give you new abilities, like changing the beam tightness or increasing the scanner resolution (adding more dots), so that every time the gimmick starts to wear thin it gets a little booster shot. Enough to sustain it for the game’s short two-hour running time at least. There’s a sense Scanner Sombre couldn’t be much more than it is, but nor does it want to be. It’s a mood piece, telling the lightest of stories, moving section to section and revealing the secrets (such as they are) of the cave, occasionally pausing to revel in its own otherworldly beauty. Or, more often, prompting you to find your own beauty in the chaotic rainbow of dots that is your lens on the world. It’s a weird experiment—and, again, one I think will utterly baffle anyone who comes to it because they see it’s by “the Prison Architect Developers.” This is considerably less mainstream, more likely to appeal to those interested in what’s being done on the fringes of the medium. Even for a so-called “walking simulator,” Scanner Sombre is austere. I’d recommend it for a certain subset of a subset of people interested in the ways developers are pushing boundaries nowadays—the ones who found value in Virginia or Beginner’s Guide or any of the other “This is a weird thing worth poking around in” games that have released the past few years. Highly experimental, Introversion's Prison Architect follow-up has you mapping out a dark cave with a handheld LIDAR scanner. It's an inspired premise, but doesn't go much of anywhere.